On Monday, December 21, 2009 at about 2148 hours, Pierce County Sheriff Sergeant Nick Hausner and Deputy Kent Mundell responded to a home near Tanwax Lake, about seven miles north of Eatonville, to handle a domestic violence call. The homeowner, Jason Crable, wanted his brother, David E. Crable, to leave. David Crable was intoxicated and being verbally disruptive inside the home. Sergeant Hausner and Deputy Mundell arrived at about 2159 hours, where they began talking with David, attempting to convince him to leave the residence. He appeared cooperative and accepted an offer of a ride from the deputies. After agreeing to leave, he gathered some clothes. David produced a concealed handgun from a shirt he was taking and began firing. He fired ten shots total, as his 16 year-old daughter fought to get the gun away from him. Sergeant Hausner was shot in the face and Deputy Mundell was shot multiple times. Deputy Mundell returned fire and killed the suspect. Sergeant Hausner was transported to Madigan Army Hospital where he recovered from his wounds. Deputy Mundell was airlifted to Harborview Medical Center and was placed on life support. On December 28, 2009, Deputy Mundell was taken off life support and died at 1704 hours. 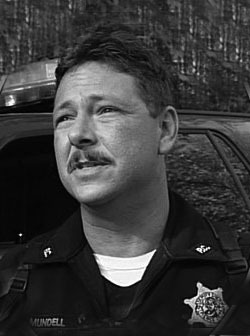 Deputy Mundell served with the Pierce County Sheriff’s Office for ten years. He is survived by his wife, daughter and son.